Civil Service Commission (CSC) provides and generates a report of rating report via online if the examiner does not meet the passing rate of 80% in Paper and Pencil Test (PPT) Career Service Examinations (CSE). Yes, it's a quick way to review your scores and those subjects need to improve for the next examination. 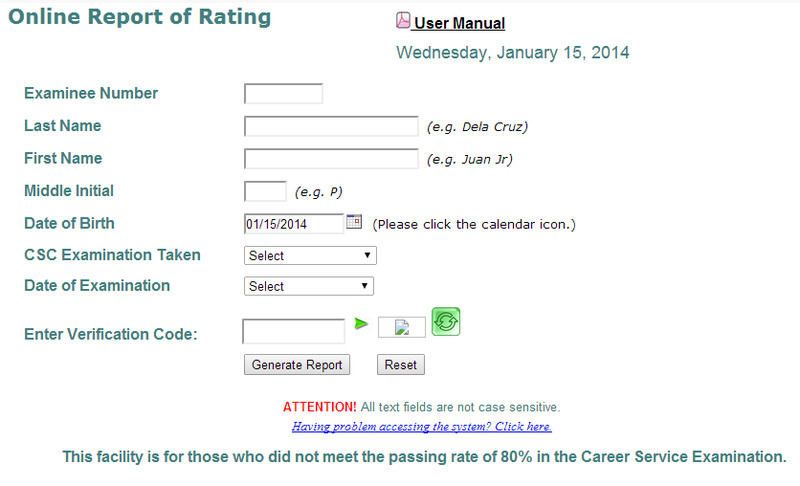 Here is a sample photo for Online Report of Rating (ROR). 1. Be sure to fill up your Examinee Number. Examinee Number is a 6-digit sequence number identifier which obtains on examination period. Therefore, it is highly recommended to secure/save that 6-digit numbers. What if I forgot the examinee number? It is best suggested that you should visit or call respected CSC Regional Office (CSCRO) where you initially filed your application form. Please take note in adding period (.) after the letter. It's a common mistake. Therefore, needs to ensure that it has no period (.). Choose the giving dates when you had taken the exam. It is a 4-character captcha code used to prevent from spam and bots. Tip: You can click the refresh icon to give you a code. 1. Firstly, you need to make sure you have submitted correct information. Sometimes, typo errors occur on data encoding. 3. If options above failed, you can visit or contact CSC Regional office branch at your nearest location for the score or any information. Do you have some questions? Feel free to comment below.